I suspect that all of us have a car from early in our lives that a parent or relative almost bought but did not. Those cars have a way of becoming a sort of idolized object that often eludes our grasp as we got older. The 1969 Lincoln Continental sedan was mine. I have written before that my father was a Lincoln Man. From the dawn of the 1970s he drove one whenever he could afford it. And he wanted one in those times when he could not. His tastes were no doubt formed from his 1940s youth spent along Philadelphia’s Main Line among the country club set who lived there. The original Lincoln Continental had been the “it” car for the stylish and well-off. Unfortunately for my father, the best his own parents would do was his socially conscious mother’s ’41 DeSoto convertible. The Plymouth sedan that his father, a thrifty New Englander, drove was not even in the ballpark. Dad’s first Lincoln finally came in late 1969 when he became the proud owner (well lessee, actually) of a 1970 Lincoln Continental Mark III. For those who were not around at the time the Mark III was the “It” car of the late ’60s – at least among those who had not yet succumbed to the allure of the Mercedes. The Mark III set a style that Lincoln (and the entire industry) would follow until the 1980s and beyond and anyone fortunate enough to be able to afford the price of entry had himself a genuine symbol of the American Dream. As for me, I had grown up admiring the Lincoln Continental of the 1960s. From a distance, of course. The clean styling and the suicide doors made Lincoln stand out as something unique and special. And wouldn’t you know it, just as my father finally lept that great chasm from an ordinary Ford into the World of Lincoln, he did so a year too late for a classic suicide door Continental. Taking its place was a new full-sized luxury Continental sedan for 1970. I did not like it as well as the older ones but I found it more appealing than the Mark III. In the interests of full disclosure, perhaps this was because at the age of ten I was doomed to life as a backseat passenger on nearly every trip and the big Connie would have been far more accommodating to those of us who did not get to spend much time in the money seats. Adult-me knows full well that by starting a new business venture in 1969 he needed a socially acceptable car but one that would not break the bank. New business ventures are expensive and there is always the possibility that things will not go as planned, so huge committments to really expensive cars can be a bad idea. I, however, knew nothing of these mundane practicicalities in 1970. I just knew that I had wanted to be the eldest son of a family with a suicide door Lincoln for as long as I could remember and my father’s stupid practicality had robbed me of that crucial experience. I got older and got over this childhood disappointment. Mostly. I have certainly never ventured into this price class as an adult so I have no room to criticize. However, on the increasingly rare occasion when I see one of these cars I still experience these little feelings of regret and disappointment. It is unusual to find a car that has not had at least one go-around here at CC by now, but it looks like this one qualifies. Paul Niedermeyer addressed the 1965 version as the last great American luxury car and the coupe and convertible versions of this 1966-69 generation have been covered as well. But Lincoln’s bread and butter was never about folding fabric roofs or Coupe deVilles without the Body-By-Fisher. Beginning with Lincoln’s all-time most successful reset of 1961 Lincoln was all about the sedan. The conservative, elegant, expensive, understated and subtly luxurious sedan. Which became iconic by the rear-hinged rear doors that were its calling card. 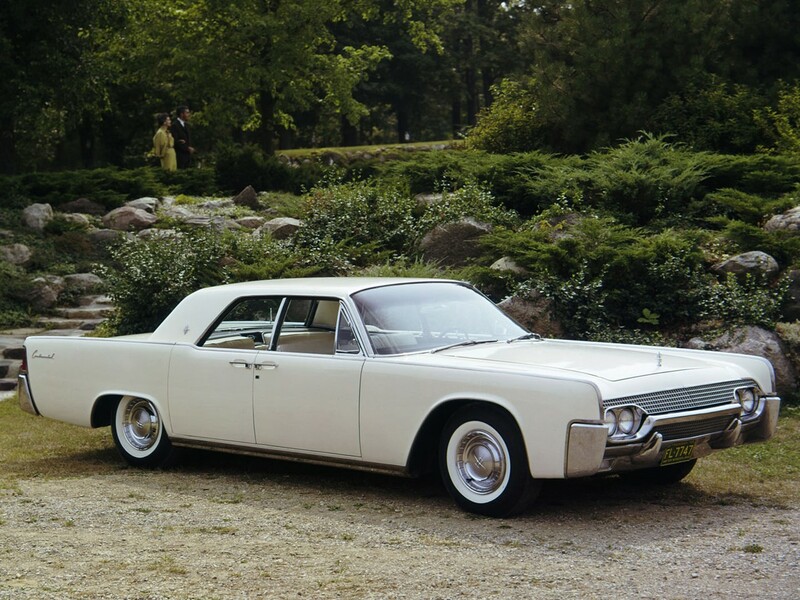 The 1966 Continental was the second act in that generation of Lincolns. Or perhaps it would be better described as a heavy update of the 1964-65 car. Although the Connie retained the overall layout and unit body structure, the car received completely new styling on a body which was longer and just a touch taller and wider than its predecessor, although it remained on the same 126 inch wheelbase. Amott B. “Buzz” Grisinger was Chief Stylist of the Lincoln-Mercury studios during those years and had a monumental task. For perhaps the first time in its history, Lincoln had settled upon a successful design that was finally finding some traction in the market and it was imperative that the new model continue these winning trends. It is difficult to argue that Grisinger’s 1966 redesign was anything other than a smashing stylistic success. All of the cues that had made the earlier Continentals stand out were still there, but subtly updated. The power bulge in the hood of the 1965, perhaps its most controversial feature, was modified and blended much more harmoniously into the new car’s more fluid shape. The curved side glass returned after the retrograde flat glass of 1964-65 and the suicide doors were retained in the most visible example of the line’s continuity. In a hat tip to the earlier Continental Mark II and the stillborn Mark III prototype of the 1950s a side ridge was added just below the beltline which served to break up the slab sides. The rear wheel openings were enlarged as well. 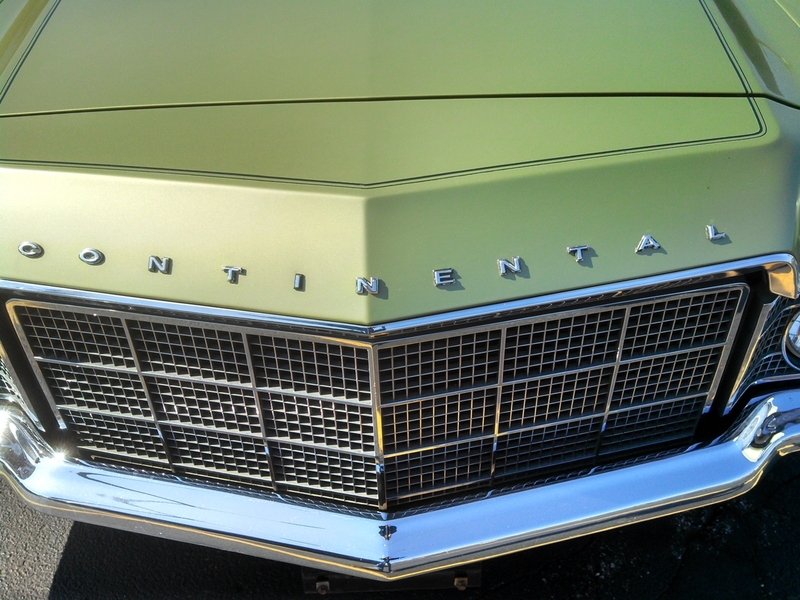 There is an argument to be made that the Continental lost a little bit of exclusivity with the 1966 revisions. A $500 price reduction (from $6,292 to $5,750 for the sedan) for a new model would provide some support for this idea. 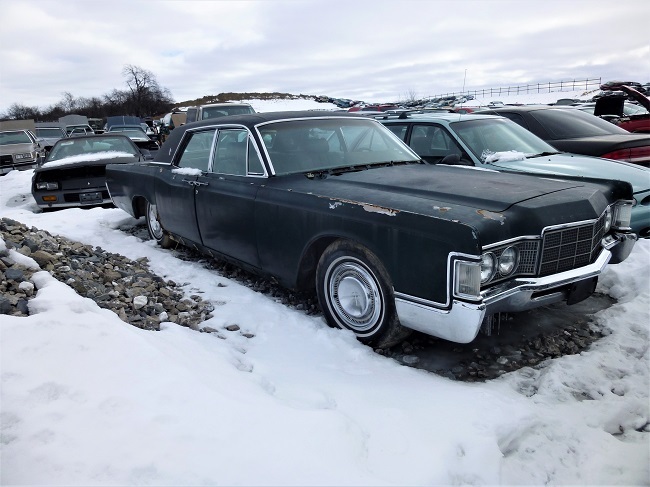 However, despite some minor cost cutting this remained very much a Lincoln Continental, right down to the hydraulic reverse sweep windshield wipers. In another nod to Cadillac’s strategy of multiple models and trim levels, a higher trim version (called the Town Car interior option) would be optional at extra cost. There is an even better argument that the annual styling updates took a toll on the 1968 and 69 models whose details were a bit more cluttered than the much cleaner 1966-67 cars. Lincoln maintained that that each 1966 model took four days to build, with each engine and transmission run on a test stand and individually examined before being placed into the car. Each car finished off the assembly process with a twelve mile road test in which 189 individual items were checked before the car would be transported to a dealer, a practice that continued on the ’69s. This 1969 model also received one last stretch in length which made it exactly one foot longer than the original 1961 version. This extra length was likely due to the newly vee-shaped prow on the car which incorporated a taller diecast grille. 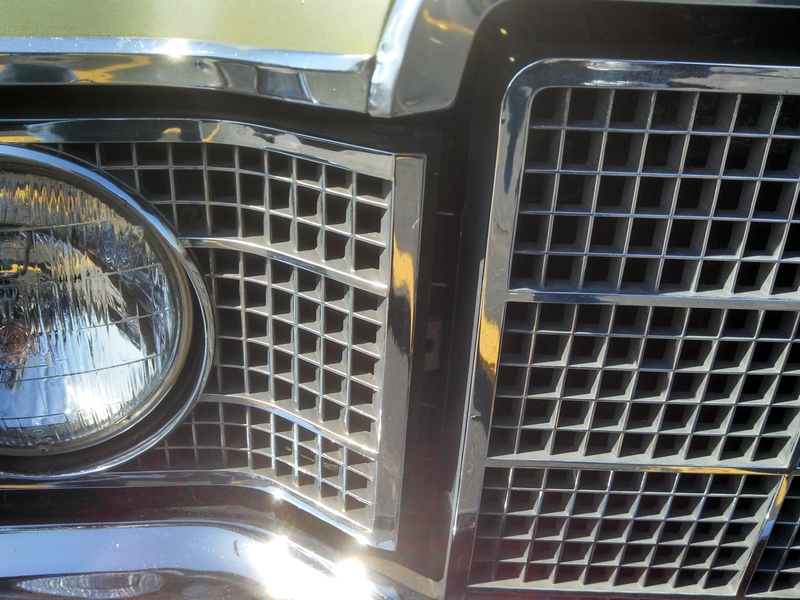 A grille which would provide a hint of the look Lincolns would sport through most of the 1970s. This car also marked the last use of Lincoln’s unit construction and its leaf spring rear suspension. 1969 was also the first full year for the 460 cid (7.5 L) version of Ford’s Lima 385 series engine family. The 460 had been introduced midway through 1968 model production to replace the 462, the final version of the 1950s-vintage MEL engine design to see production. Despite losing two cubic inches to the older design, the new engine brought another twenty-five horsepower to the party, jumping from 340 to 365, although torque ratings remained unchanged. But all good things must come to an end. When the 1966-69 version of this car was in the planning stages Lincoln’s plan of elegant, expensive cars with subtle year-to-year changes was a winning one with sales increasing each year. Unfortunately the trajectory of the Continental’s second act was more or less the opposite. The above chart shows a bell curve in which Continental production peaked in 1966 but lost ground each year thereafter, essentially coming to rest below 1965 levels. The next generation would continue this trend with 1970 production dropping to 1962-63 levels before climbing to a bit over 35,000 units in ’71. For context, Cadillac (excluding Eldorados) produced over 223,000 cars in 1969. It would be 1972 before the Continental would see any significant improvement in demand, an improvement which would finally be more permanent. These figures, however do not tell the entire story. 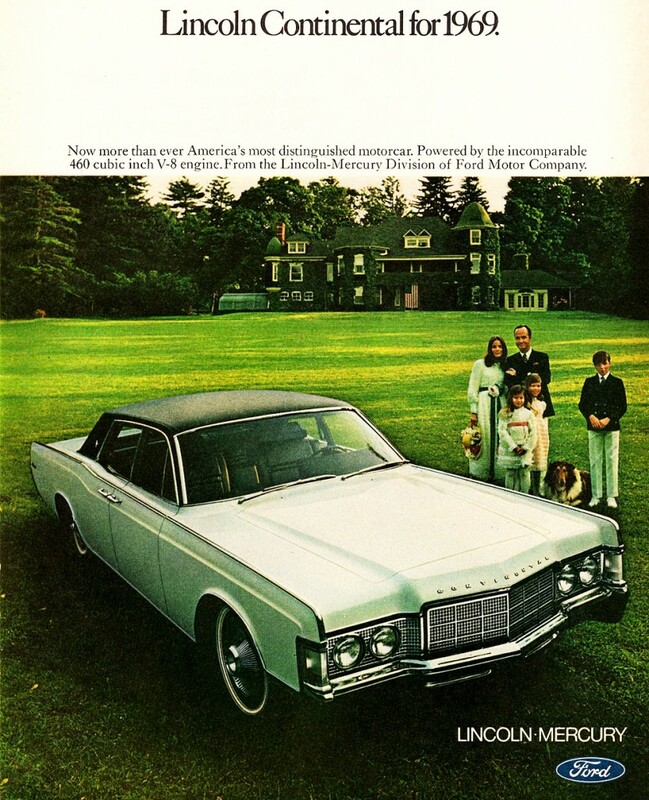 In the spring of 1968 Lincoln would begin producing the Continental Mark III. Some have called the Mark III a glorified Thunderbird, given that they shared the Bird’s body-on-perimeter frame construction and much of the running gear. It was, however, much more expensively trimmed and carefully built, at least to a greater extent than the Mark IV and V that would follow. 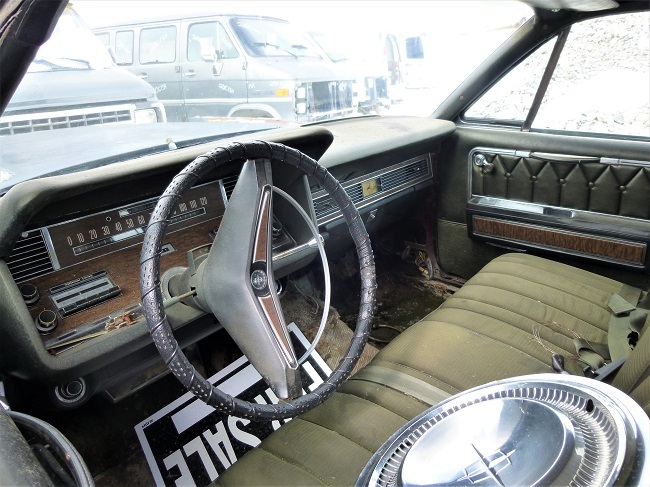 At a substantially higher price than the Continental sedan, the Mark III was where the action would prove to be for Lincoln, which built nearly 31,000 of them during an extended 1969 model year. 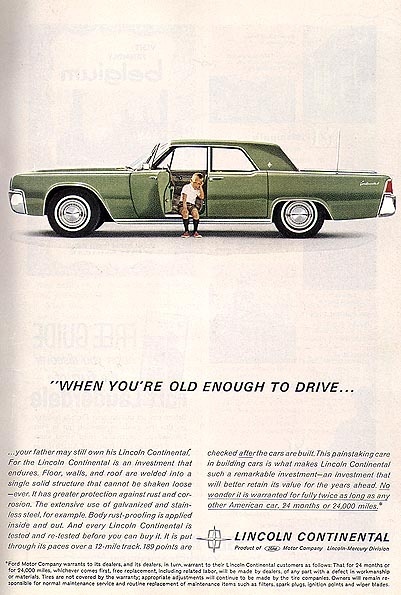 And according to George Dammann’s Fifty Years of Lincoln-Mercury (Crestline, 1971) , the Mark III was on backorder during that entire time. 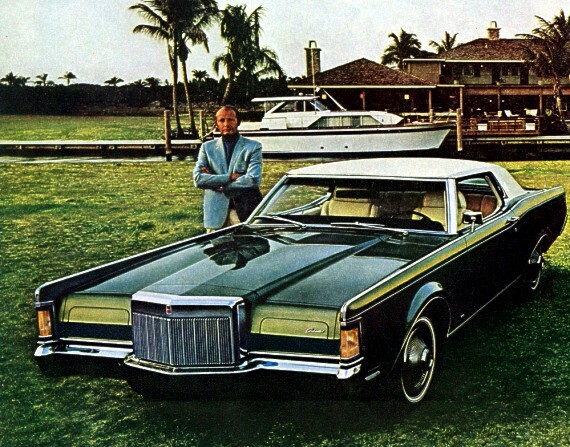 By 1972 the Mark IV (the most expensive car built in America) would be Lincoln’s leader in both image and production volume with 48,591 Mark IVs to 45,969 Continentals. 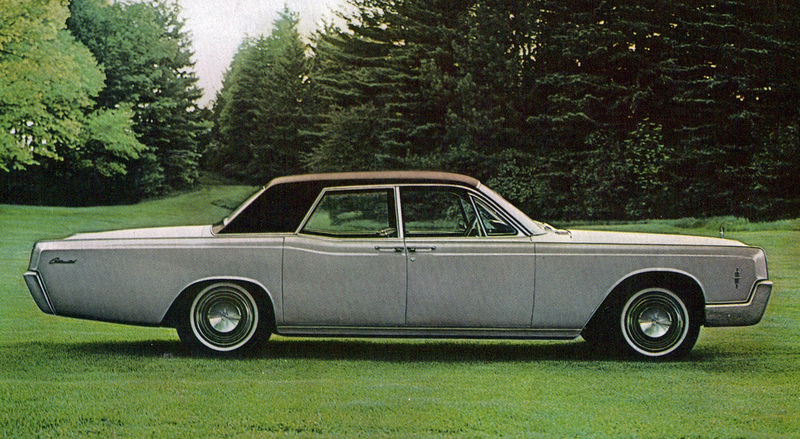 My father and I had no way of knowing that the Continental sedan that was in showrooms at the beginning of the 1970 model year was a completely different kind of car from the departed 1969 version. Hindsight has told us that the follow-up model was a very thoroughly luxurified Mercury. 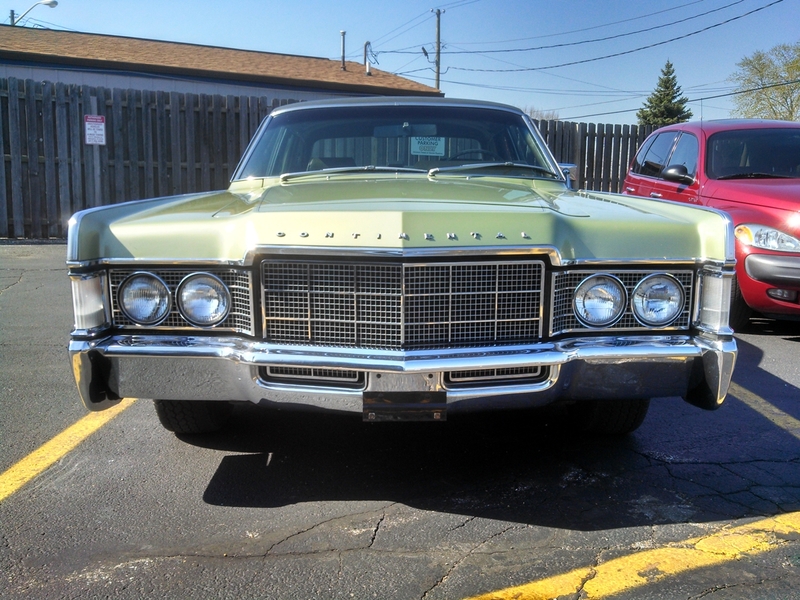 A very nicely done Mercury with a longer wheelbase, its own body and an appropriately luxurious done interior. However just as had been the case in earlier eras, one crawl under the car and it would have been difficult to distinguish the two. In Lincoln Continentals as in national affairs, Camelot was well and truly over by the end of 1969. My father’s Mark III would turn out to be something of a lemon (making its yellow color perversely appropriate). After several mechanical problems it would be towed into the dealership of his good friend and an order was placed for a new 1972 Mark IV. A 1970 Continental sedan would probably have been a better car – the law of averages would suggest that almost any Lincoln would have been. 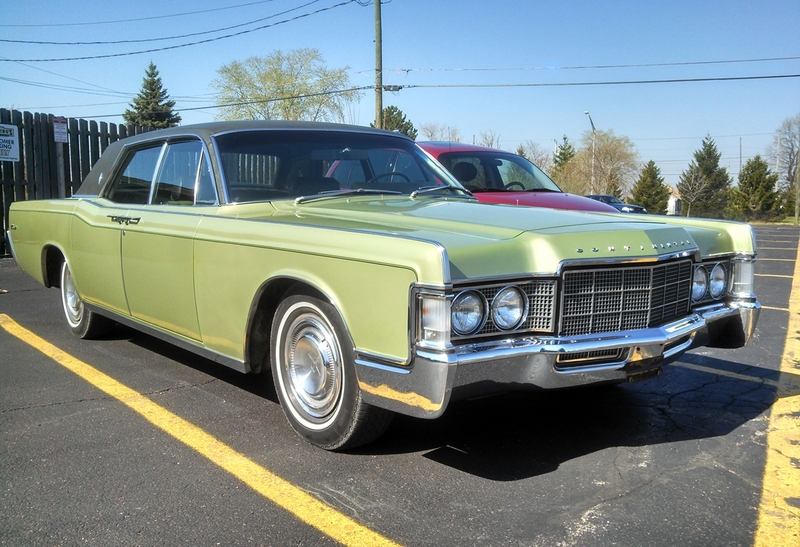 But I continue to believe with all my heart that a 1969 Continental (following its twelve mile road test) would have been a car that would have made my father both happy and proud. And it would have done the same for me. As a little EU boy in the 70s watching US flicks on TV and watching cars with those doors I was completely floored. And that is one hell of a beautiful sedan. Same here, as a slightly older Australian teen. An instantly-identifiable undeniably-prestige sedan. Somehow these seemed more distinctively prestigious than just about anything else out there. It wasn’t just the rarity here in Australia (I’ve still never seen one in the metal), nor the novelty of those rear suicide doors (the Rabbi’s ’37 Plymouth had them). It’s the look. Sheer design genius. An all-time design classic. a good day. 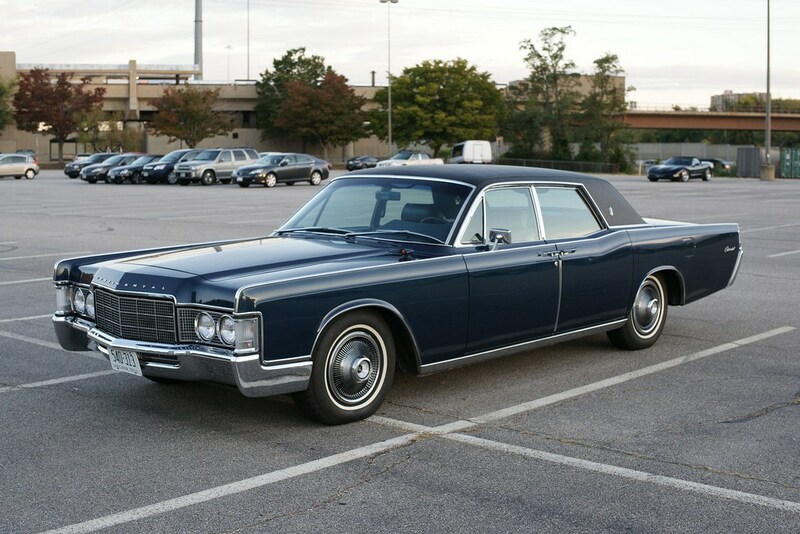 Also had a 1963 Continental that I purchased for $300.00 around 1977 and later sold it for $300.00. I thought at the time that being able to drive in the highest of luxury, with just repairs and maintenance, was a pretty good return on my investment. I am sure there were a few cars that I wanted my father to buy, foolishly thinking finances were never a problem/consideration. Yet, it has been so long ago I just can’t remember them. I would guess that when the Granada/Monarch first hit showrooms I thought my father should trade the family’s Comet for one or the other. When I was a kid there were no Lincolns rolling down the street in my small town. Thunderbirds were few and far between, too. For that matter, Mercurys were not very numerous, either, as the nearest Lincoln-Mercury dealership was 20 miles/30 minutes away. This car? I’m conflicted, as I prefer earlier year examples with their less cluttered looking grilles. The colors, too, are an acquired taste. Yet, I would bet it looked pretty good when it was new. When he came back from work, I would grab a car magazine, then run to my father and start pestering him car test results, going like: can´t we get this car? see, how great it did in this comparo…. I think that many of us did that as teens. And as an adult, I can’t count how many times I’ve considered buying something much, much nicer, only to reconsider when I realize the other things I can do with the money, like home improvements, my hobbies, or travel. Just the amount paid for taxes on the vehicle of my dreams would pay for a nice trip to Europe. As much as I hate to admit it, I’m turning into my parents! I would like to have done that, but living in a small rented flat, I knew a new car was never an option. When I think over all the car magazines I’ve bought over the years since, I could probably have afforded a Lincoln by now! I for a long time thought the 1961-1979 Continentals were all cut from the same cloth, so subtle were its yearly changes. Even the 1970 overhall slid by my eyes – of course I noticed the rear doors no longer opened backwards, yet the rest of the car had very similar contours to the 1969 vintage. I knew nothing about unibody architecture or leaf springs when I was a kid. I just knew they looked kinda the same. Now that I know the difference, I’m surprised Lincoln went full steam into unibodies way back in 1958 when normally only small cars, mostly imports, used that design. Didn’t unibody construction and leaf springs exacerbate NVH at the cost of tightness and light weight, and that’s why Chrysler went to all-unibody in 1960 except for its huge Imperial luxury cars which remained BOF for another 7 years. That made sense to me – the expensive luxury car needed a quieter, smoother, more isolated ride. So why was Lincoln doing it backwards, building unibodies with leaf springs whereas Fords and Mercurys got BOF and coils? I think Lincoln embraced the unibody in the 50s because it was cool. I think they stuck with it through the 60s because production volumes were low and because the Wixom plant was set up for them (along with the Thunderbirds built there through 1966 before that model embraced the frame). 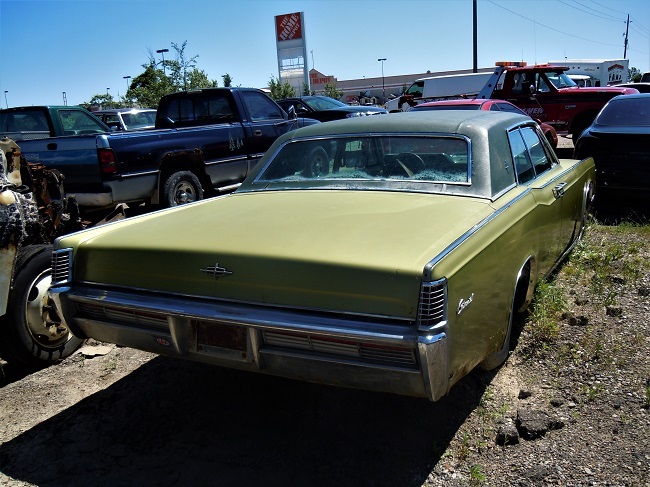 I suspect that low volume also kept the Imperial from getting a new Unibody in the early 60s. Ford’s unibodies were interesting because they weighed so much. 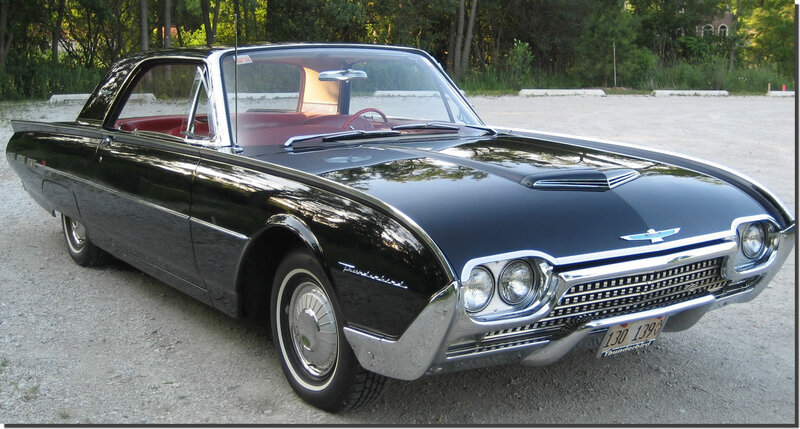 My 61 Thunderbird hardtop was a 113 inch wheelbase car that weighed about 4300 pounds. 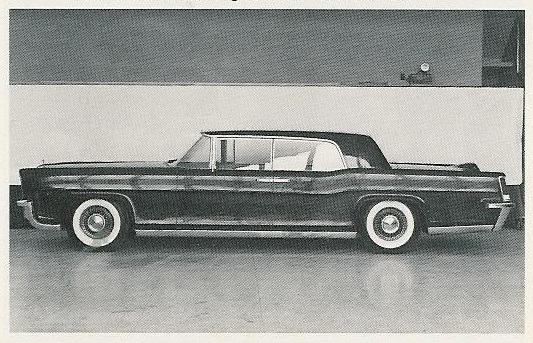 I recall that the Lincoln 4 door convertibles weighed nearly 6000 pounds. A lot of that was surely for isolation and sound deadening, which those did very well. The suspension question is interesting. The 58 Lincoln used coils but switched to leaves in 59, for reasons I have never known and stuck with them through the rest of the 60s. Ford and Mercury didn’t get coils until the 65s, so again I think Lincoln’s delay was due to low volume on a unique platform. I read years ago in “Collectible Automobile” magazine that there were a lot of problems with the early prototypes since Ford really did not know how to build a large unibody car. The prototypes would bend and buckle during testing. Supposedly they purchased a Nash Ambassador for ideas, and kept building up and bracing the Lincoln’s unibody structure until it would hold up. (Remember, no computer aided design back then.) When they were done the result weighed more than a traditional body-on-frame design. The reason for Lincoln’s switch to unitized construction was in a word: Thunderbird. McNamara didn’t like the idea of the T-Bird not being a money maker and so he pushed to have a 4-seater version produced. He figured a 4-seat T-bird would make it profitable. Earle McPherson was one of the engineers that pushed to have this new car made with unitized construction. Likely, a big reason for it was to make it lower profile than BOF construction of that time would allow. Once the T-Bird was committed to be unitized, it was decided that the Wixom plant would need another car produced with unitized construction to make the factory cost effective. Lincoln was the natural choice due to it’s low production numbers like the T-Bird. Apparently, Lincoln had the unitized construction basically forced on them. The early Ford unitized construction was heavily reinforced to make it structurally sound, which was added so much weight. Ford did a lot of testing before production to ensure it would be structurally sound. I remember with the T-Bird, the compared it to a ’57. Initially the ’58 T-bird did poorer over a tortuous test circuit, showing more body sag. But eventually after further refinement, the ’58 Bird body structure was superior to the ’57. Ford also compared it to a ’56 Hudson. The Hudson failed after 800 or 900 miles of the tortuous test circuit, while the T-bird was still within spec after 1500 miles. The reason for coils in 1958, was Ford planned to introduce an air suspension, but decided last minute to abandon it. Without the need for the airbags, leaf springs were a more cost effective suspension. Those two, McNamara and McPherson, were the culprits who foisted unibody on Lincoln in spite of how inappropriate it was for a large car. In addition to the excess weight, it limited body style selection which was still important then. Much more of their ‘management’ and Lincoln would have gone belly up. There is nothing intrinsically about a unibody car that suggests it should have worse NVH. Actually, more like the opposite: early unibody cars like the Nash and Linclns were specifically built that way to create a structurally stiffer (hence quieter) structure. And that was the case, but they did that by building a very strong and heavy structure. Meredes and other European manufacturers also showed that unibodies were extremely solid and could be very quiet as a consequence; think Grosser 600. The reputation of unibodies being flimsier and having more NVH comes from the lightweight cars that invariably used this, like the Falcon and Chevy II. Keep in mind that the perimeter frames used in big cars by GM and Ford after about 1965 or so were not classic “body on ladder frame”; they were essentially unibodies with front and rear subframes that connected along the perimeter. These frames were useless by themselves; they were an integral part of the combined structure, which included a body carefully designed to have a lot of strength. Ford and GM used this construction because it created a result that was more cost efficient and easier to optimize than a unibody without the benefit of more powerful 3D computer analysis.There’s a reason all modern cars are unibody. > Keep in mind that the perimeter frames used in big cars by GM and Ford after about 1965 or so were not classic “body on ladder frame”; they were essentially unibodies with front and rear subframes that connected along the perimeter. > There’s a reason all modern cars are unibody. BMW i3 and i8? The passenger cell is a unibody, but aren’t they sort of on a separate frame? Excellent find and account on this car. You have finally given the 1966-1969 Continental sedan justice. While Cadillac may have been more popular by far, there’s something to be said about the Lincoln’s more “hand-built” aura and exclusivity, both in its actual exclusiveness from other FordMoCo cars and its smaller production numbers. I certainly can relate to that feeling of a parent almost getting the car that you wanted them to get. While I’m happy to say I’ve generally been very successful at getting my mother to listen to my input and get the car I want her to get, it’s usually been the specification of that vehicle she gets that leaves something to be desired. This works really well in profile, especially the rear volume. In some ways its better than the too-short 61’s profile, but no improvement over the 66. I’d take one over a MkIII, but I’d take a 72 MkIV over both. That colour its fantastic. Great find. 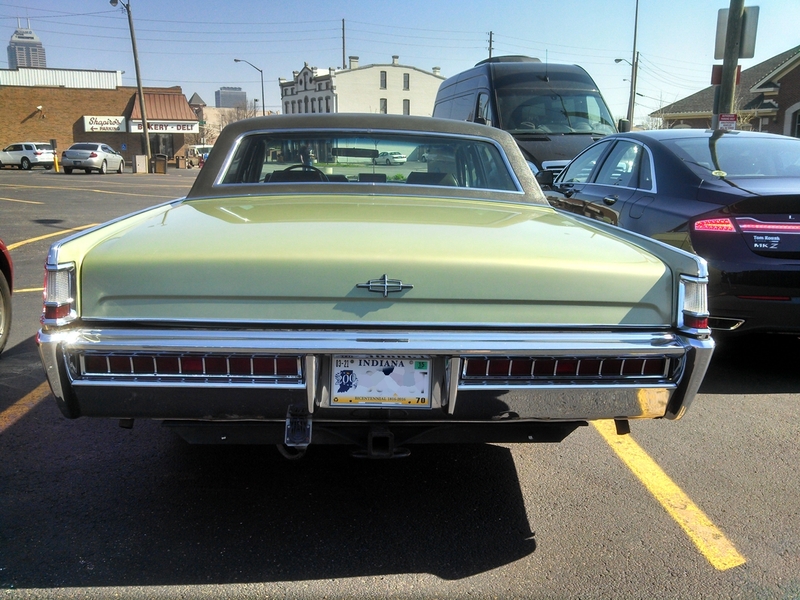 My main gripe with the 68-69 Continental is that taillight treatment. I like the lights in the fender blades (1961-65) and I like the low wide lights (1966-67). But these fender blade lights are too high and too small and just serve to clutter up the back end. I kind of like the 1969 grille. It is not really original but it is nicely done and updates the car well. That color was hugely popular on FoMoCo cars in1967-69. I didn’t like it much then, hated it in the late 70s (especially after owning two of them) and have come to terms with it now. Not my favorite but it is perfect for a car from that era. 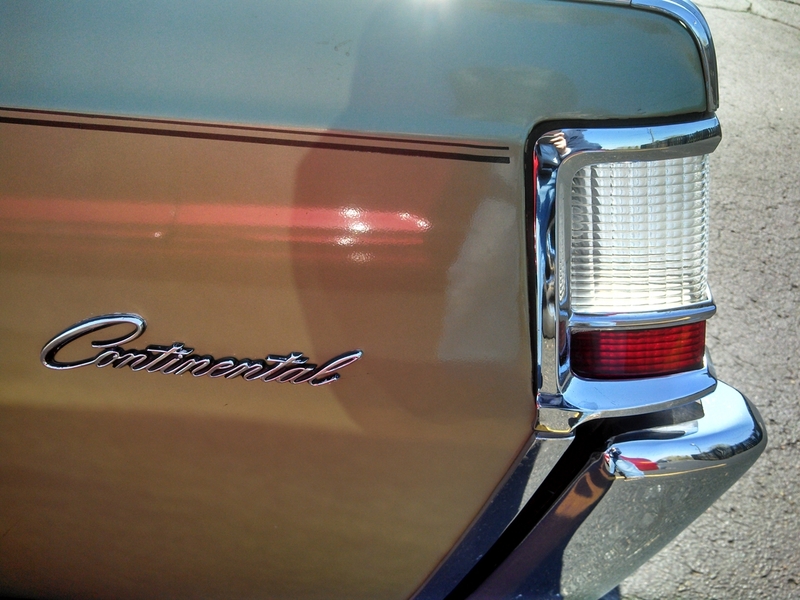 Seeing those tail lights made me think of the Mark 2 Continental. You’re right about the lenses JP. They do detract from the purer profile of the 66/67. Plus the first iteration has a nice leading edge on the front blade. Engel’s 1965 Chrysler design obviously shares much with his ’61 Lincoln, but until now it hadn’t occurred to me how much the facelifted ’67 Chrysler looks like the ’66 Lincoln. 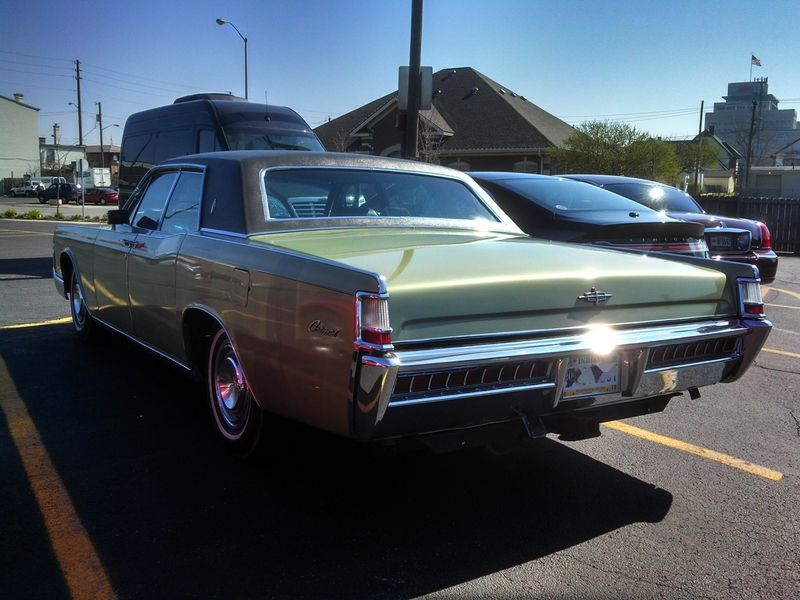 While the beltline on the Chrysler stayed straight, that sloping kick up seems to have found its way to the ’67 Fury. In 1978 my folks went shopping for a station wagon a little bigger than our dreadful Pinto. The plush Aspen demonstrator at the Dodge dealer seemed like a much nicer car (I’m sure it was well optioned) than the stripper Fairmont we ended up with. Since we ended up keeping the Ford for 7 years with no major problems, I suspect it was the better choice. Hmmm, I can’t say that I have ever seen the kinship between this Lincoln and the 67 Chrysler. I will have to think some more about that one. That’s because I was remembering the Lincoln wrong. What I’m seeing is mostly that high character line and the brutally square front fender, but now I see that Lincoln didn’t get that until ’68. Great piece on the “great miss.” The Continentals of the 1960s really were landmark cars, and I agree that the styling revisions for 1966 were one of the rare occasions when an excellent, clean design was enhanced rather than wrecked by a makeover. To my eyes at least, the “suicide door” Continentals also aged well–they looked “classic” rather than “old.” There was a ’69 Continental sedan in my neighborhood when I was growing up, and the car was often parked in the street out front of the owner’s house, well into the 1980s. It was light blue with a black top and black leather interior. I’d walk my dog by it frequently, and I always remembered admiring it as a really nice car, timeless rather than dated. The “one that got away” for me was the 1979 Cadillac Sedan DeVille. My Pop wanted one, but his pragmatic side kicked in and we wound up with another Oldsmobile. ’79 was the last year with the appropriate amount of power from the 425V8–it would be debored and weakened to a 368V8 for 1980, and things would only get worse for Caddy engines in the ’80s from there…. Well, the 368 was way, way better than the HT4100! Great article. One significant bit of de-contenting for 1966 was the deletion of the functional temp, amp, and oil pressure gauges found on the ’64-’65 cars. The 1966 had just speedo and fuel gauges and warning lights for the rest. My favorite of the ’66-’69 Continentals is the early coupe model. I’m not a fan of the more formal 1968 coupe and I think the 1969 facelift was a bit of a mess, particularly in the front. I’ve always been intrigued by the side glass devolution/evolution in these Continentals, because I can barely see the difference, so subtle was the curve. Some make a huge deal of the flat glass in the ‘65s and ‘66s. Was it done as an expedient way to achieve a slight increase in interior width, or was it merely cost cutting? The Continental got a major revision in 1964 and from what I can tell the number one design objective was more room. The wheelbase got longer for a more accommodating rear passenger compartment, which was the biggest change. I suspect that they knew the car was getting redone again for 66 and the flat glass was the cheapest way to get a wider roof for a more expansive area up high – I think the 61-63 cars had felt just a little claustrophobic the way the windows curved in so significantly. The ’61 ’64 Continental was essentially a four-door coupe, which makes sense since it was based on a proposal for the ’61 Thunderbird. Ford decided that competing head-on with Cadillac was out for the time being, so they built a car that nobody made: a close-coupled four door sedan (coupe, in other words; “coupe” means “cut down”), and convertible. As Jim said, for ’64 they decided they needed more interior room, so the body was lengthened and the roof widened to create a legitimate sedan. Frankly, I think the flat roof works very well with all its other flat surfaces. It creates a more formal look. But with the more curvaceous ’66 restyle, curved windows were essential, for more reasons than one. Nice find, I hadn’t realized the suicide doors stayed until 1969. Not that I ever saw a Lincoln in the 60’s and 70’s. We were solidly in Rambler territory. I was always sad when Dad would bring home cool cars on a test drive and not buy them, the RX7, the MGB. However he did once show me a 1981 Cutlass 4 door sedan he was thinking of buying. I said “Dad, please, no” and he bought a Regal two door instead. Thanks Dad. I fairness my dad brought home a couple of white Taurus sedans in the 90s. His last car was a 97-ish Continental sedan. Every time I looked at that car 1) all I could think of was one of these and 2) how un-special the new one was. Apparently, it wasn’t as easy since there were many differences between the 1966 & 1969 models. Also, I remember when I was a kid & my father bought his ’73 T-Bird that I wished that he got a ’70-’71 “Bunkie Bird” instead. I still prefer the styling of the earlier Bird. Great story and article JP. it reminds me of september 1973 My mom was thinking about a new car, the 1974 models just came out. i was so excited and feared that she would buy something that i did’nt like. mind you i used to go around to the car dealerships to see if i could get a glance of the new cars before debut day. anyway i couldnt be happier as back then besides Cadillac, my favorite cars were Chevy’s especially the Monte Carlo and the Caprice classic. she was going to get one or the other(she was leaning toward the Caprice cause of 4 doors)but it was not to be, she did the numbers and decided she wasnt ready for a new car yet. That is a really fascinating question on the wipers, especially since the 1961 Thunderbird which was reputed to share some of the cowl structure with the Lincoln used opposing wipers that met in the middle. I have always wondered 1) why develop a whole distinct system from that used in the Thunderbird and 2) if there was some engineering reason which made it easier to adapt a system to the T-Bird’s right side wiper than to its left side one. Or else they were going for a foreign vibe? 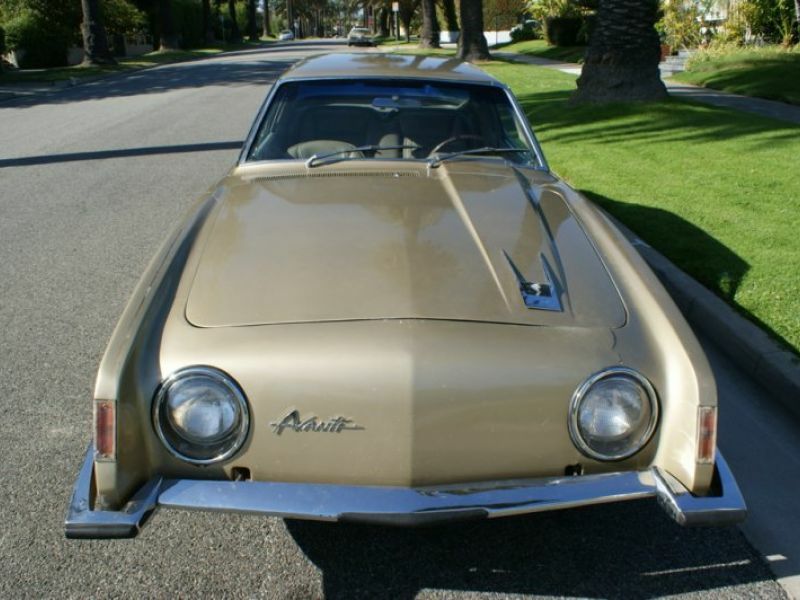 The Avanti’s reverse sweep was dictated (at least to my understanding) by the asymmetrical hood bulge that lined up with the driver’s instrument panel. The picture shows how the Avanti’s wipers would not have worked very well with the cowl if they swept the other way. Ford also used reverse sweep wipers on their L- series commercial trucks. Having spent some time driving them, I can say that they work well. There wasn’t the uncleared area that you would expect. Ah, I now see how things tie together on Avanti. Splendid! I loved those Lincolns, thanks for posting this. Ironically, the ’69 is probably the least attractive of this group, but it was still more stylish than the ’70 (and the box that it came in). I often wonder how many sales Mercury siphones from Lincoln with the ’69 Marquis. Ours was a Cadillac/Lincoln kind of neighborhood. I remember when the Eldorado came out, there was only one family that I saw that had one. White with the Black/White houndstooth interior. But when the Mark III came out, they were literally everywhere, and they were usually wive’s cars. Ditto the Mark IV. I love the Mark III’s, but those 60’s Lincoln Sedans leave me cold. I know I’m supposed to bow down before them and worship in full humility, but I just can’t. Never have had any interest in them. The 75-79 and to a lesser extent the 80-84’s are my idea of a true luxury car, but that’s mainly because thats the time I grew up in. I was born too late (Sept. 66) to have lived the 60’s experience. I was born in May ’64 and feel pretty much the same way. These “Kennedy” Lincolns were from a Camelot we now know never really existed. Growing up in the ’70s my memories of these were as the cars favoured by the villains in the old ’60s James Bond films I watched on TV. 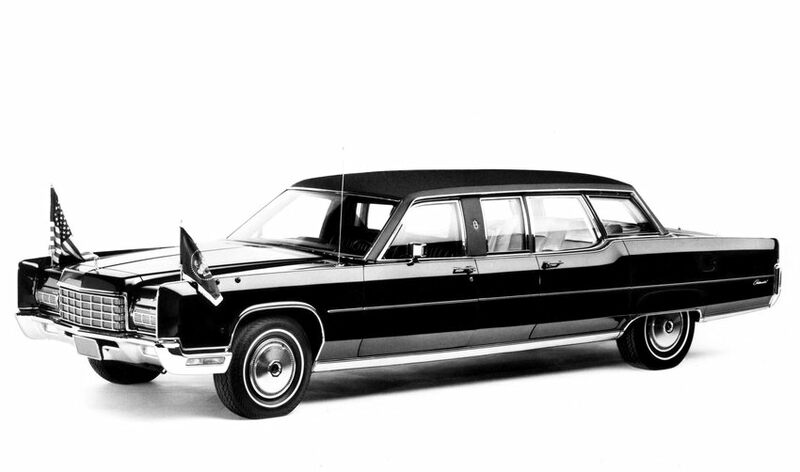 Aside from the Mark III (driven by Dean Martin in the Matt Helm Bond parodies) I much preferred the ’70s Lincolns. 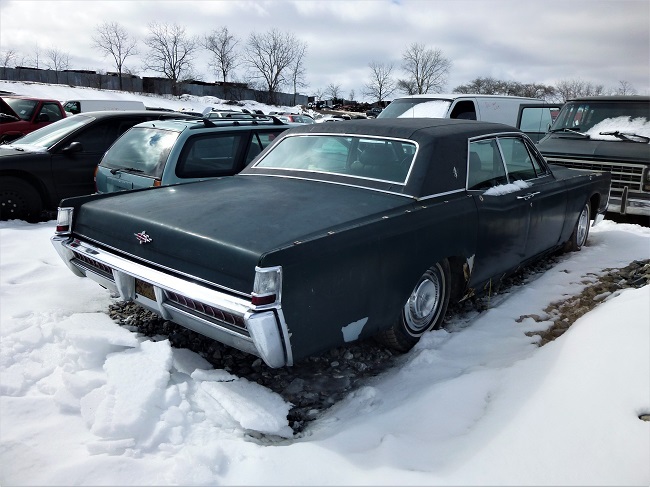 Although the details of these later unibody Lincolns are debatable, at the time these always exuded the image and quality its owners were looking for. And as you said, the 1970 was a huge let-down. 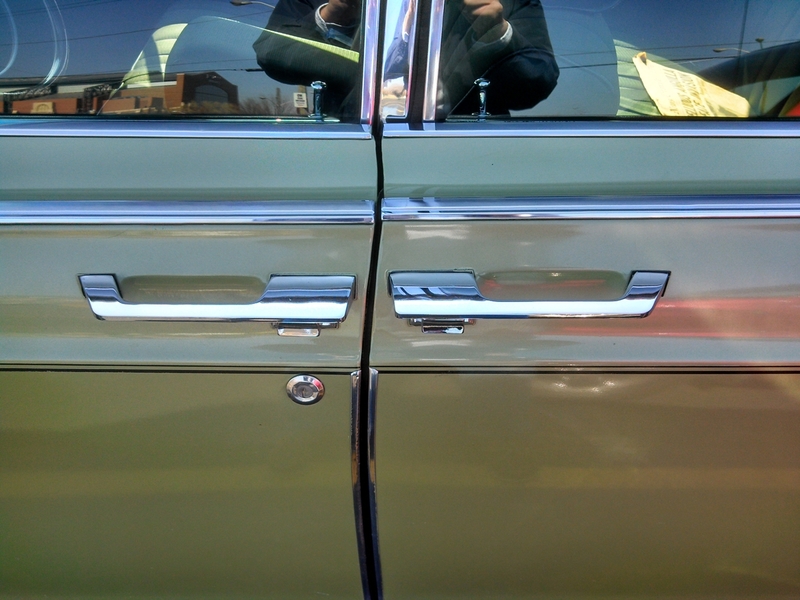 Great write up on the suicide door Lincolns from the sixties. My favorite Lincoln of this era is the 1963 model, but have always like that important looking grill on the ‘69’s – what an elegant interior. When you mentioned that your dad didn’t want a heavily discounted ‘69 Lincoln it reminded me of my father, however, my Dad would only buy a new car at year’s end and how this led to some confusion in my early years of auto identification. In the 1960’s my dad’s employer provided him with a new Buick Le Sabre about every two years. At the start of the 1966 MY Dad traded in a 1959 Plymouth (Mom’s/family car) for a 1965 Buick Special with a V6, which was paid for in cash (I was only 3 then). Dad always said that the ‘65 was almost identical to the ‘66s, so for many years I assumed the ‘64s were from 1966. They kept the Special until beginning of 1974 when it was traded for a heavily discounted new 1973 Ford LTD. After I smashed up the Ford in 1979 he bought a 1977 Oldsmobile Delta 88 starting a trend of used cars. Nice write-up on a beautiful car! I’d be interested in the story of this particular car, it looks absolutely mint. Looks like you had owner cooperation to get the interior shots. I agree with most here that the 60’s suicide Lincolns were great, and that the 66 restyle was a success. 64-65 is probably my favorite, but 66-67 is a close second. A shame they didn’t continue the convertible to the end. I’m surprised these didn’t have a standup hood ornament in 69. Yes, the 70 was a come down, but I have to say it makes sense from Lincoln’s perspective. Having a unique body and chassis for a relatively low volume car is expensive. With the luxury market moving so heavily to coupes, Lincoln was making more money on the Marks so it makes sense to shift resources to that and have more underskin component sharing for the sedans. Funny thing is that Continental sales increased through the 70’s even though the car was less special. You raise an interesting point. With 20/20 hindsight Ford would have gotten a good return on the investment in a unique Lincoln platform for 1970 because the 70s would turn out to be Lincoln’s first consistently strong decade, perhaps ever. 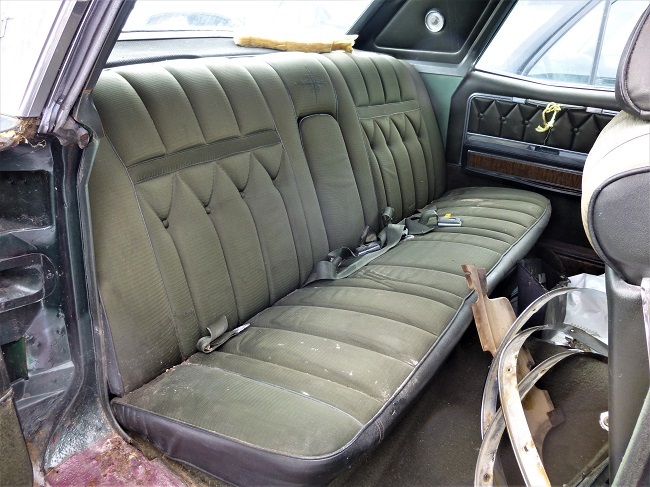 After weathering 1970-71 Lincoln sales really started building and by the end of the decade sales were consistently at or over 80K annual units (excluding the Mark IV/V). I bumped into this car quite by accident. 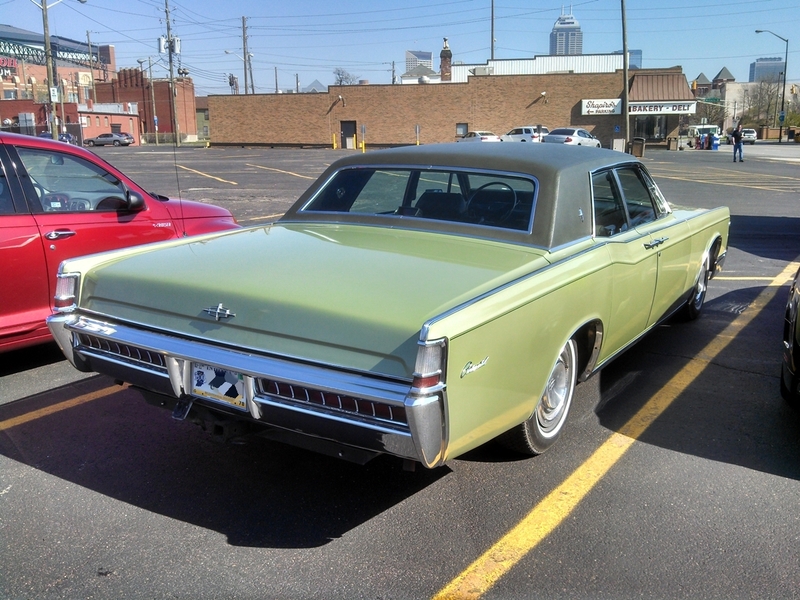 I was picking up a carry out order at a downtown deli (Shapiros for you central Indiana people) and a few members of the local Lincoln & Continental Owners Club were meeting for lunch. It has been awhile but the owner was showing the car to a friend of his and I sort of hung back so as to not get in their way, but did ask if I could get some pictures of his beautiful car. It would be hard to find a nicer original car from that time period. The location reminded me of my father too because he liked to go there when he came to town, saying it was the only really authentic delicatessen he had been to since he left the east coast. After 50 years, as poised and elegant as a Rolls Silver Shadow. Breeding will always tell. Good point. Ageing well, like the Shadow, whereas the 80s Silver Spirit looks a bit too much now. This is none very good looking, if quite big, car. “Breeding will always tell.” Agreed. Even after all the revisions, the ’69 Continental remained a lovely car. 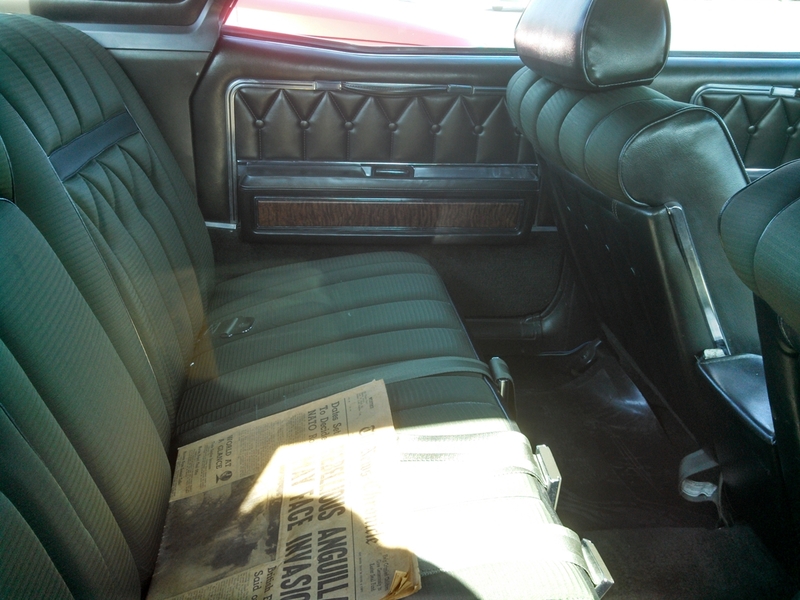 Incidentally, did any one else notice the 1969 newspaper on the back seat? British forces invaded the island of Anguilla in March 1969. Talk about period authenticity! For goodness’sake: a large prestigious car in metallic green. It’s wonderful too. Where did the idea come from the bright colours only work on smaller cars? In the 50’s/60’s/70’s my folks had a group of friends that they socialized with frequently. The group had a number of things in common- they were all German immigrants, they all owned their own businesses, and they were all fairly successful. So, when they all gathered at our house, the driveway looked like the front line of a Mercedes dealership. As a bit of trivia, those folks owned The Cove restaurant inside the Ambassador Hotel in LA. No longer there, but quite the spot in the 60’s. I seem to recall seeing a 1970s??? era film where a group of men in a suicide door Continental were trapped in a drive-through car wash by someone who dropped a horseshoe over the door handles so the occupants couldn’t open the doors…then the car was set on fire, as I recall. Anyone else recognize this scene or movie? Sounds like The Seven Ups. 1973. Fantastic CC movie, plus one of the great period car chases. Made by some of the same guys who did Bullitt and The French Connection. They should have rolled down the windows and removed the horseshoes. Great post and subject matter. In my case, the old man was after a replacement car in 1972, and heard that a Montreal livery service was selling six month old Pontiac Laurentian’s for $2800. We went to see the car, which looked tired, with 20k on the clock and scrapes and dings everywhere. They parked a triple black ’67 Fleetwood Brougham next to it, and let on that it could be had for the same price. I did everything a 12 year old could do, and we ended up with the Caddy! Dad managed to wreck it within five years, but the Pontiac would have been a rusty mess by then as well. Attached are a few junkyard shots taken of the subject matter from a couple of years ago. As you can see, plenty of good parts from hard to find cars, but unfortunately I was after GM parts! Look how nice the seat/panels held up. This appeared to be a failed restoration project that was junked because it sat outside for a while in the grass, and that rusted out the underbody. Next up was a slightly older example. Note the sensor for the auto dimming option on the hood, which is a nice bit to have for any restoration. A nice 68. It is funny, I have owned a 60s Cadillac and a 60s Imperial but never one of these. I feel incomplete. At least your dad didn’t do what this guy did. Nice car but for 1969 I would have chosen the Mercury Marquis or even the Mercury Monterey over this car, my favorite of the 1960’s Lincoln Continental’s are the 1966-67 models, I’ve thought the suicide doors looked dated by 1968-69. I don’t know about you but I’ve thought the 1970+ Lincoln’s were an improvement over the 1968-69 Lincoln’s. As a what-if hypothetical – would it have been feasible to adapt a suicide read door onto the Mercury-based body? That would have gone a long way to keeping the Lincoln unique and worth the upgrade. In a word yes, but at what cost? I’m sure there other reasons besides cost that this wasn’t done. Maybe they thought it was time for a new look after 10 years of suicides. I’ve had a bit of experience with 60’s Lincolns. My Dad bought a lovely ’63 sedan that was frost white, a very light blue, almost white color, with a silver blue leather interior. The styling was beautiful and simple, I really liked the way the greenhouse sat down below the upper fender line. The front seat had large individual back rests with a fold down center arm rest, which gave the impression of front bucket seats. The rear seat backrest was faired into the package tray with very nice shiny metal trim. The door handles were set in a brushed metal panel. The quality of the material and assembly were very apparent. I later had a ’66 sedan and again I thought that the quality was much better than the ’64 and ’70 Cadillacs that I bought a few years later. My Dad had a ’69 coupe which was equally as nice as our earlier Lincolns. 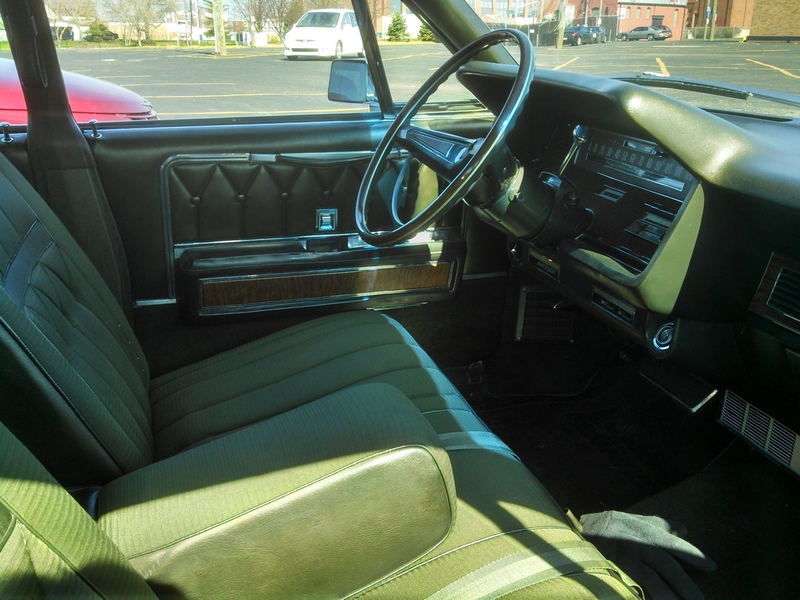 Truth be told even my beloved ’77 Coupe de Ville fell short of these quality standards. I never thought of these as gussied up Mercurys. In fact the Thunderbirds of this period were equally fine. Even though there was a Ford name on them, everyone knew that they were really Lincoln siblings. A truly nice Lincoln in spite of the color! Thank you for pointing out the variations of these Continentals. Like a few others, I didn’t realize the distinctions. In true CC Effect I saw a white ’63 Continental yesterday, moving down the street under its own power. What a nice ’69 Lincoln Continental. I never cared for the Mark III’s that were introduced in the late ’60s, but I really liked the suicide-door Conti sedans. So I bought a ’67 in early 2000. I never considered buying a ’60s Lincoln 2-door sedan — I wanted a four-door model with the groovy doors! One thing I recall from my time as its owner was the more I drove it the better in ran. I haven’t seen a ’60s Lincoln ‘in the flesh’ since I sold mine back in 2015. I hope whoever owns it now drives it more than I was able to. It only had 45,500 miles when it was sold; for a 48-year-old car that’s not much. 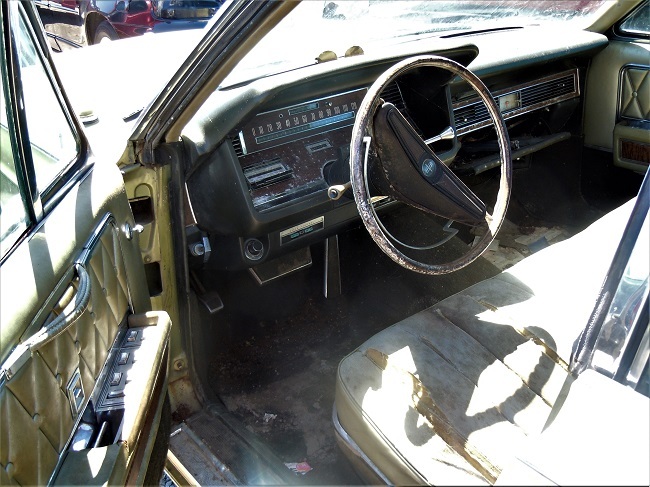 The steering wheels on the ’67s were considerably different than the ’68s and ’69s. 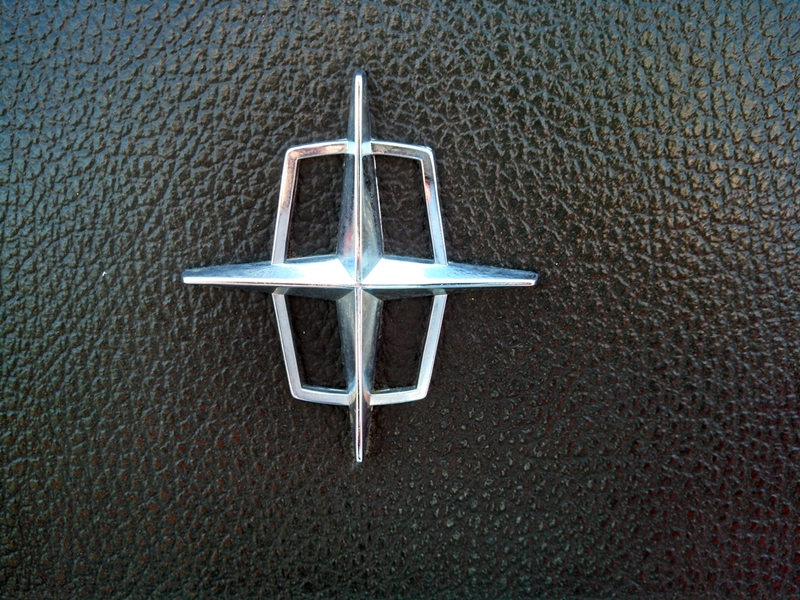 There was a round hub in the center with the Lincoln symbol in the middle. I had no shoulder belts in my Linc, either. I think shoulder belts became mandatory for American passenger cars for the 1968 model year, but were still only optional for 1967. I could see where the shoulder belts would have been attached had the original buyer chosen that option. By ’68, however, that ‘option’ was chosen for you by the Feds. I do miss the Linc. I just couldn’t drive it enough. The suicide doors were dropped in ’70 because a survey revealed that, while Lincoln owners liked them, Cadillac owners didn’t. I owned a ’69 sedan in the early ’70s and set a personal time/distance record, Atlanta to Towson, MD. averaging 80.00 MPH. That was point to point, including gas stops! An excellent road car. In the late 1960’s, I was still a young Lincoln enthusiast, would have loved it if my dad had been able to afford a new Lincoln. While the 1966-67 restyle impressed me as continuing the elegant 1961 theme in a refreshing form, the 1968-69 models felt like they’d lost their enthusiasm for the car, just fiddled with the details while it played out the last two years of the uni-body platform. The loss of the convertible sedan was a major blow to my enthusiasm; the formal-styled coupe looked heavy and dowdy. The 1970 styling appeal to me more than 1968-69 but I was disappointed when I realized the suicide doors were gone. The conventional excuse given was that Cadillac buyers didn’t like them, so they had to go. We now know the real reason was so that Lincolns could share platform components with full-sized Fords and Mercurys toward becoming a more profitable make. It made sense from a business standpoint but made the cars seem less special. Surveying Lincoln sales, the last two door, non-Mark Lincolns that sold as a high percentage of annual sales were the 1956-57 models. The 1958-60 percentages dropped every year, small wonder the style was dismissed for 1961. It was surprising they returned it for 1966, but to no major success. 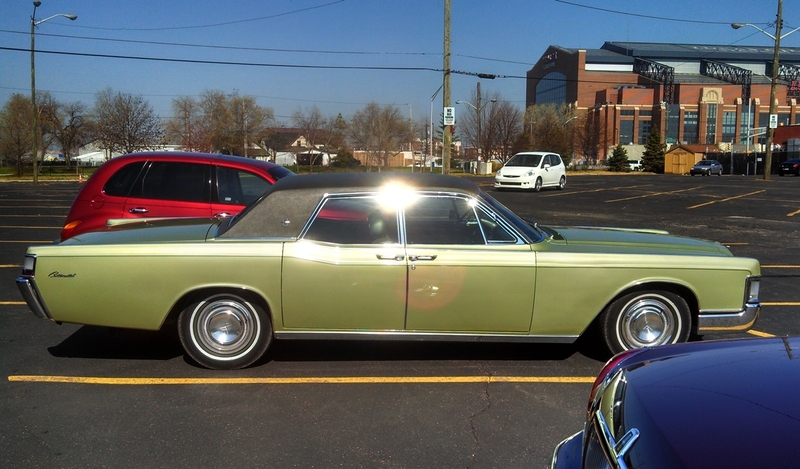 Seems the public couldn’t embrace any two door Lincoln that wasn’t a long-hood/short-deck Continental coupe. Not very exciting cars (the Buicks were comfy) but as I am now 41 years old, I have come to realize that despite the lack of excitement in my folks cars, they always had 2 of them at all time which is more then a lot of folks had. My grand parents also always had at least 2 cars at all times too. Which in the 1940’s- 1960’s was still rare. Your shoe is ringing, Mr. Smart. The car my dad missed by that much was probably a ’78 Ford LTD Landau, with the ’78 Chrysler New Yorker Brougham as an outlier. He seemed to briefly contemplate upgrading his plain Jane ’76 LTD for a few years while it “still had value.” Both cars were prominently up on platforms on the corners of their dealer lots on our nearby auto row. He did eventually go full Brougham with a box Crown Vic LX some years after I was out of the house. I have no science to back it up, but it seems like the ’60s Continental is now more prolific than the Cadillac that outsold it by about 7:1. By 1969, elegant, a bit staid, and with all due respect to Packard, patrician. America’s Mercedes is some ways. With the increase in volume in the ’70s, it sort of lost the plot over time. My favorites of the ’60s Connie are probably the ’64 (got the size and proportions right), the ’66 (sort of sealed the ’60s Lincoln look for me, the older cars were mostly gone when I was little), and the ’69 (I don’t know, I just like it). I think I’m over green car hatred. Everything was green at that time, it was normal and I admired them back then. But, I still want mine black over dark blue, just like the mental image of every car in my head.